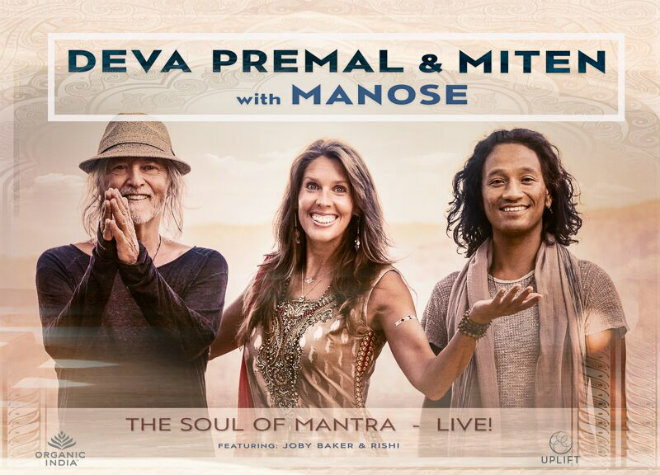 This trio has traveled the world for 12 years, uplifting thousands with Deva’s soulful renditions of ancient Sanskrit chants, Miten’s inspirational songs and Manose’s sacred flute. Their concerts have a reputation for being life-transformative. The voices, the music and the communal chanting invoke a shamanic meeting of body-mind-spirit. Flame carriers of a 5,000 year old tradition, Deva Premal & Miten are at the forefront of the burgeoning world-wide chant phenomenon. They grace festivals, concert halls, rock venues and cathedrals around the planet and have hosted online mantra meditation programs with over 200,000 participants. Merging ancient mantras of India and Tibet with contemporary musical settings, their debut album, The Essence, introduced a unique musical genre. The album rocked to the top of World Music and New Age charts where it still remains. (Deva Premal: The Essence – 1999). Since then, Deva & Miten have released over 17 albums with sales exceeding one million. Their ‘fans’ include such diverse luminaries as His Holiness the Dalai Lama, Cher (who recorded and performed their version of the Gayatri Mantra), motivational guru Tony Robbins and author Eckhart Tolle. Deva & Miten are accompanied by Nepalese flute maestro Manose. Born in Kathmandu, Manose has performed extensively with them and is featured on many of their albums, including Cosmic Connections and Temple at Midnight. * For more information on the Toronto concert, contact Nirmal at nirmal@thewellnesspath.ca or 416-716-1402. * For more information on the band and their tour, please visit www.DevaPremalMiten.com.